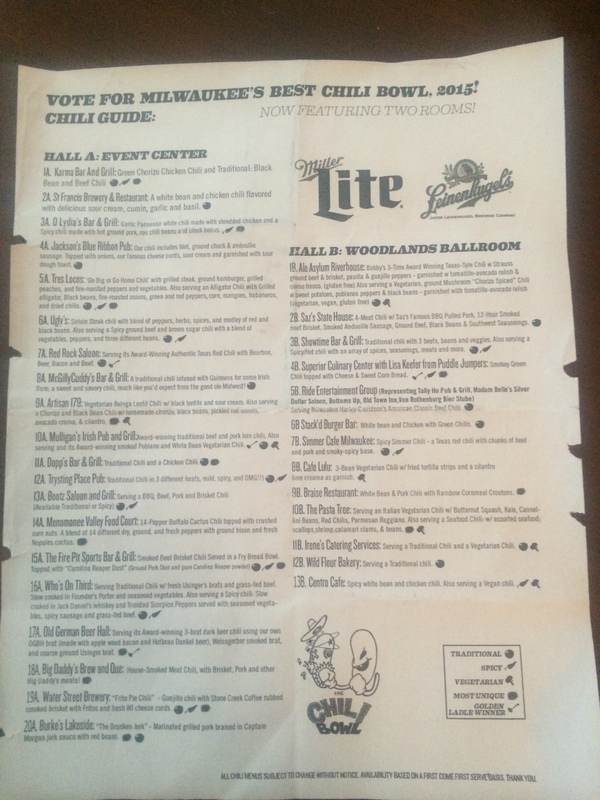 MKE Chili Bowl 2015, Potawatomi Casino & Hotel – My winner has been declared! It didn’t take long for my friend and neighbor, Andrew and I to decide we wanted to go to “The 2015 Chili Bowl”, so he purchased tickets and off we went to the Potawatomi Casino and Hotel. When he handed me my ticket, ticket number 1770, I cracked a joke about whether there would really be almost 1,800 people at the event. 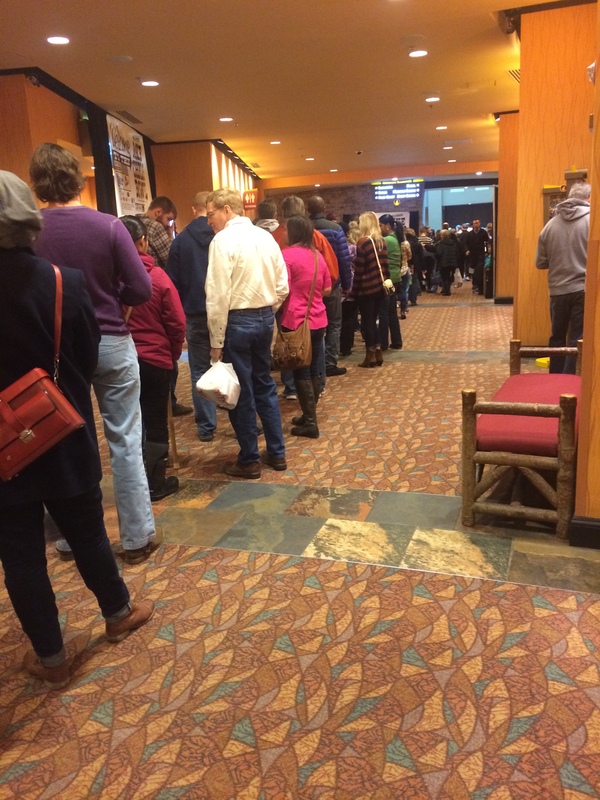 Well… rest assured that there were several thousand people at the Chili Bowl! People waiting to get registered for the Chili Bowl. The actual registration is beyond those doors in the background! Tickets were only $13 in advance ($16 at the door), and that allowed for eight 3 oz tasting from a list of 33 vendors. It was also a fundraiser for the Hunger Task Force (2 cans of food allowed folks two additional tastings). Please note: Handling cups of chili, a cold beverage, while trying to take pictures just didn’t work, so please forgive the lack of photos. I mapped out our first four adventures (4A, 15A, 20A, and 4B), Andrew picked our fifth location (7A), then Andrew’s friend Max picked vendor number six (7B), and we all agreed on vendor number seven (9B) – at which point we quit – bellies just full enough! Don’t you just love our high-tech method (tearing out notches on the printed page!)? In the first ballroom, we all liked “4A” best – Jackson’s Blue Ribbon Pub’s effort. A traditional chili described as “…filet, ground chuck & andoullie sausage. Topped with onions, our famous cheese curds, sour cream and garnished with sour dough toast”. 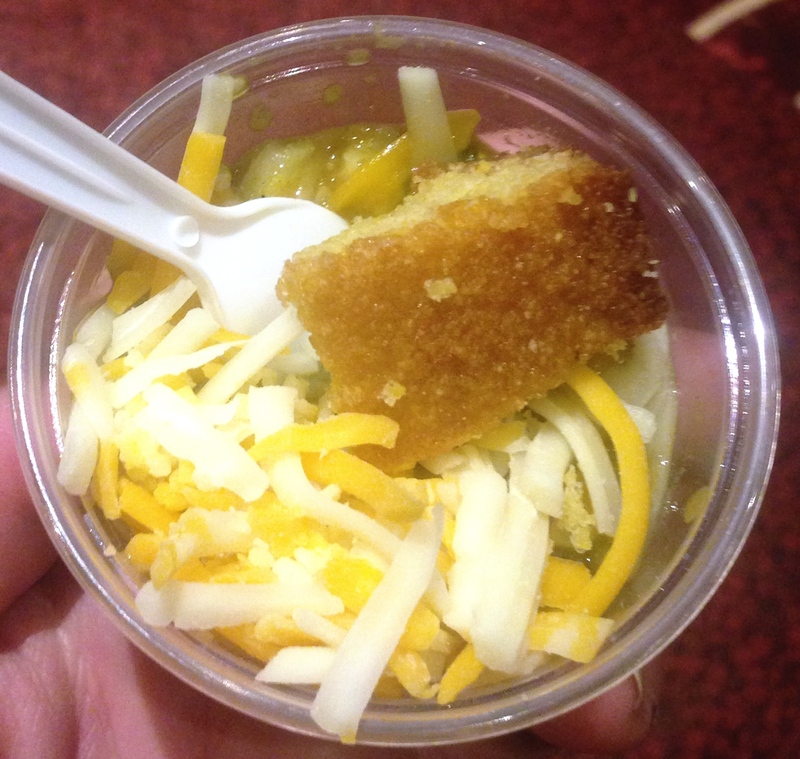 The overall consensus winner was in ballroom B though…”4B” – Superior Culinary Center with Lisa Keefer from Puddle Jumpers, described as “Smokey Green Chili topped with Cheese & Sweet Corn Bread”. Superior Culinary Center submission – smokey green chili topped with cheese and sweet corn bread. It had really good consistency, tremendous flavor, and was just different enough to be special without being too much of a departure from “chili” as I grew up knowing it. The very close second place vote (again, consensus) was “9B” from Braise. We all agreed to try the chili tagged with “most unique” title in past competition. This year the submission was “white bean & pork chili with rainbow cornmeal croutons”. We tasted a hint of curry to the chili – which also had great consistency and was full-flavored. It might have been difficult to consume an entire bowl of this flavorful fun, but 3 oz was a perfect taste. Other honorable mentions go to: “15A” – The Fire Pit Sports Bar & Grill, mainly for the Fry Bread Bowl in which it was served. “7A” (Red Rock Saloon) was another well-received submission – bourbon, beer, bacon and beef…need I say more? All in all, we had a fun time navigating the dense crowds and figuring out which chili recipes we wanted to taste. It was a perfect event for an overcast Milwaukee Sunday afternoon. I’m looking forward to seeing who wins the coveted “Golden Ladle”! I’m off to Orlando for business tomorrow, so hopefully I’ll have more good eats to write about soon. If you have any suggestions, please leave a comment! It’s all good far as chili goes, but I didn’t know yall had CASINOS in MKE! That was the first time I had been, Ant. It’s just moments from my place, so easy to plan a visit. We’ll have to get a call together to plan an itinerary.